Product #45648 | SKU DRPLSMB700D | 0.0 (no ratings yet) Thanks for your rating! The newest technology in high-output LED lighting is unleashed with the Dracast Surface Series. Surface Series lights are the product of several years of development and feature the highest output yet seen in a Dracast LED panel. Surface Series lights are a totally new design that utilize large, surface-mounted LEDs with special lensing that allow for extrodinary light output from a compact panel. Each Surface Series light is available in 3200K (Tungsten), 5600K (Daylight), and 3200K - 5600K (Bicolor) CCT. Each is rated at >95 CRI and are housed inside an anodized aluminum frame. Surface Series lights operate cool to the touch despite being such high-output fixtures. 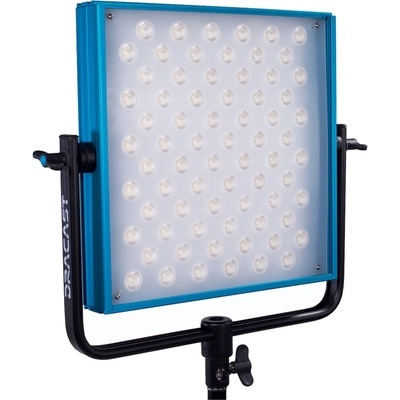 Most models include a v-mount battery plate, making them well-suited for studio or location lighting. Size 18 x 17 x 8"